Have you recently #justsaidyes? Congrats! It’s time to celebrate with one of our favorite pre-wedding events, the engagement party! 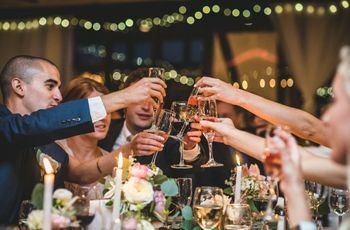 Traditionally held by the the bride’s parents, the engagement party is a chance to pop some bubbly with close family and friends to kick start your engagement. Thrown within a few months of the proposal, this event is where many family members get to meet for the very first time. 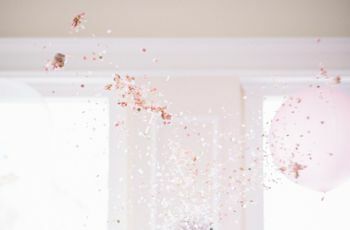 Therefore, you’ll want to make sure you cover all the essentials for a fun-filled engagement party that's also affordable. Heres how to pull off an amazing engagement party on a budget. 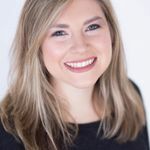 Remember that this party isn’t your wedding, and you don’t need to invite everyone that is on your wedding guest list. Keep the party more intimate by inviting close friends and relatives and save the big party for your wedding day. Having a smaller guest list will let you spend more on other party essentials, like food or decor and will also keep a laid back and fun vibe. However, make sure that anyone you do invite to your celebration is also going to be invited to your wedding. Candle lighting is an easy way to create the perfect ambiance for your party in a budget-friendly way. Instead of opting for elaborate table decor, dress your tabletops with candle votives and dim the overhead lighting just a tad. Then check out your nearest florist or grocery store and pick up a few florals for the event. 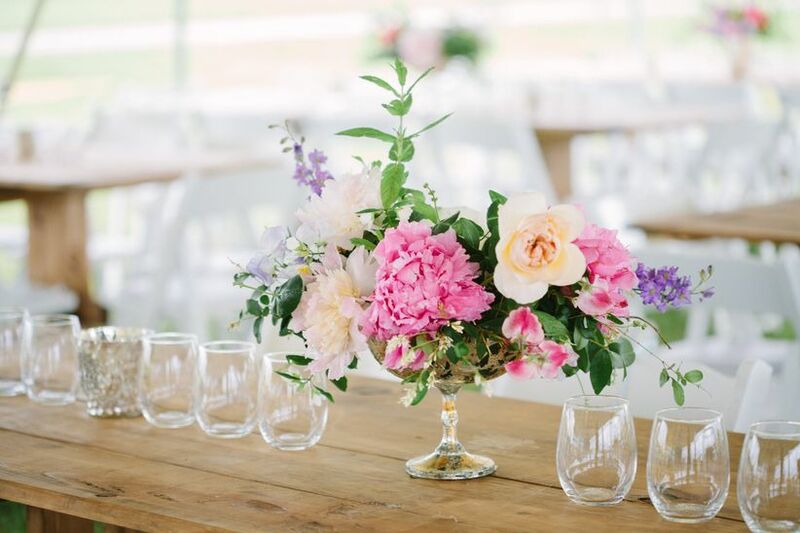 You can easily decorate with fresh blooms placed in compotes or vases to add some pops of color to your party. The candle lighting also pairs well with any lush arrangement. You don’t have to go all out when it comes to choosing the entertainment - that’s what the wedding is for! Instead opt for a light music by playing a queued playlist that will keep the mood upbeat during your party. 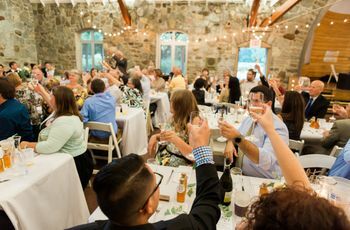 Games aren’t required for an engagement party, but if you are worried about the party becoming dull we suggest setting a time to make a few toasts and introductions. That way you can easily say thanks to your guests for joining your celebration and also introduce important family and friends to one another. Don’t feel the need to have a heavy course meal. A sit down dinner can easily add up, leaving your hands tied when it comes to expenses. Instead opt for light appetizers and bite sized food. You can easily have a few tables filled with hors d'oeuvres and also either pass out champagne or create a simple mixed drink. Or you can even opt for a dessert spread instead! Instead of a dinner party, host the event after dining hours. Then plan a menu filled with tasty confections, like cake pops or flavored pies. This type of serving style lets guests eat and drink as they please and won’t feel pressured to have a formal sit down dinner. This also lets you stick to that easy casual party vibe. 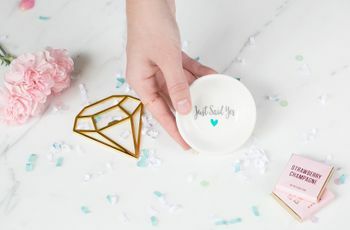 It is proper etiquette for guests to not bring a present to an engagement party, therefore you shouldn’t feel the need to go all out on favors. However, if you really feel the need to pass out some kind of favor to thank guests for attending your party, opt for inexpensive favors. Some of our favorites include edible favors or some kind of handmade gift, such as letter or personalized trinket.